Although we’re not 99.9% sure when an earthquake will strike in Los Angeles, an earthquake early warning system would help the city take additional precautions and almost certainly save lives. A group of high school students is partnering with the USGS to test how it might work. 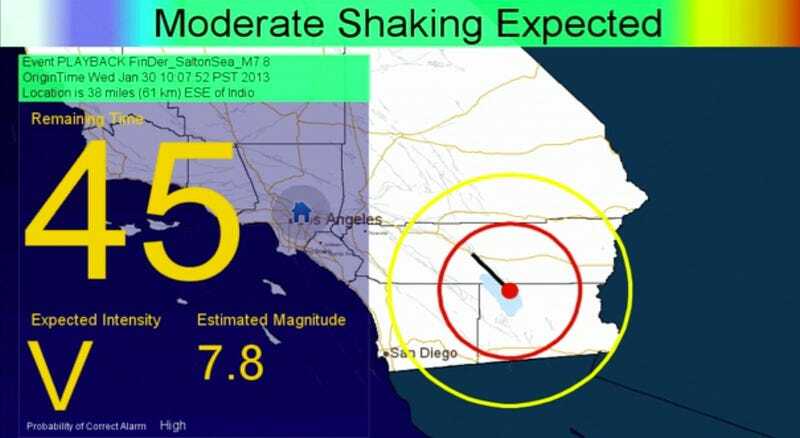 Students at Eagle Rock High School, in Northeast LA, will be the first to use the same ShakeAlert system currently installed on computers at USGS headquarters at Caltech (I got to see this same system demonstrated last year). In addition to learning how researchers study seismic events, the students will test the early warning system’s user experience and help determine which of the various alert mechanisms are most effective in encouraging the general population to take action. Although a EEW system has been prototyped for many years by a team including USGS, Caltech, and UC Berkeley researchers, there was not enough funding in place until this year to bring it to the public. Earlier this year the Obama administration allocated $5 million to its implementation, and earlier this month, California Governor Jerry Brown set a target date of 2016 for the system to be up and running. Now 125 additional sensors have been placed throughout Southern California which finally give the EEW system the density it needs. Early warning systems have been used for many years in countries like Japan. Hopefully those high school students can also help teach people who live on the West Coast how to get prepared instead of freaking out.